So one of the reasons for returning to Taiwan was to celebrate my Sister's wedding with my extended family in Taiwan. As you may have noticed food is a very central theme in Asian culture. What's that title picture got to do with it? Nothing. 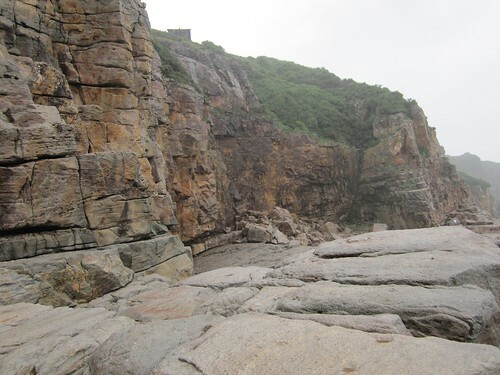 Actually that's a picture of the rock we were suppose to climb but got rained out. We did manage a nice hike, but I'm sure that was a poor replacement for my brother in-law who was looking forward to the climb. Anyhow it just seemed like a nice picture to lead us into "The Banquet", I'm not making light of the title, 13 courses of food with no fillers. That's right no rice, no "extra carbs" just lots and lots of food. Ok there's 13 courses, no need for a lot of my yammering it'll be like the last post. Small plate appetizers to start us off. I'll spare you the other photo. We have smoked tofu, bitter melon, roasted peanuts, lilly flowers, pickled daikon radish, and pickled seaweed. 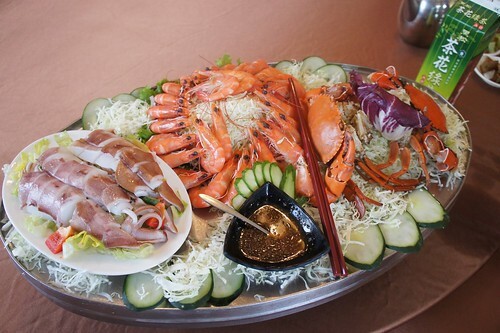 Seafood platter with blanched squid, shrimp, and crab. Served with a garlic soy vinegar sauce. Out comes the sashimi course. On the upper left is one of he largest oysters I've eaten. The really new one for me is near the right of center. It's fish that has been sliced to expose the yellow roe. I'm not sure if it's flying fish roe or not. All of the fish was exceptionally firm and fresh. I guess that's what happens when you're near the source. Tea smoked duck. This is a traditional presentation of the duck where you have the crepes on the left and you build your own "burrito" with duck, plum sauce, green onion and cucumber. 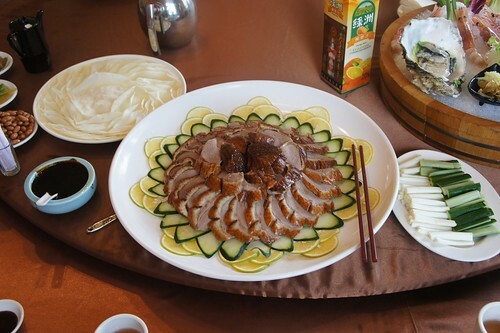 Unlike Peking Duck the skin is not separated from the meat and the duck is smoked with a wok with tea leaves to impart flavor. 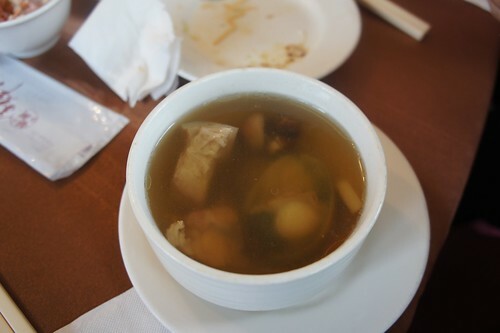 Abalone soup. This isn't actually abalone, but a cousin that is many times smaller. I need to get the name for this. It resembled a noodle dish. It's actually a large helping of vegetables, mushroom, and egg. There's baby shark fin here. I know it's controversial, I'm simply a guest here don't shoot me. 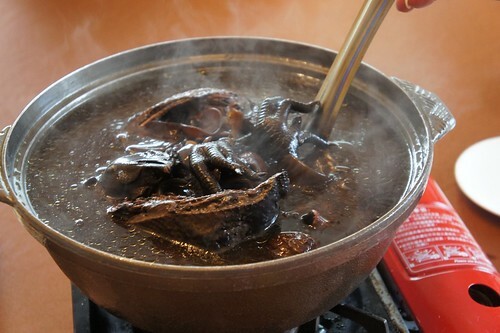 I've seen this ingredient on the show "Chopped" it's called "black boned chicken soup". The chicken is a black skinned and black boned chicken. 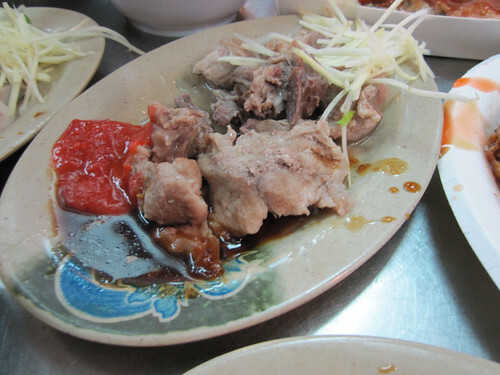 The meat is also darker in color but otherwise tastes like regular chicken. The traditional preparation is a soup that is very "boo" or "hearty". I really have a hard time explaining this one. It's a very thick and rich broth infused with a lot of traditional Chinese herbs and medicinals. 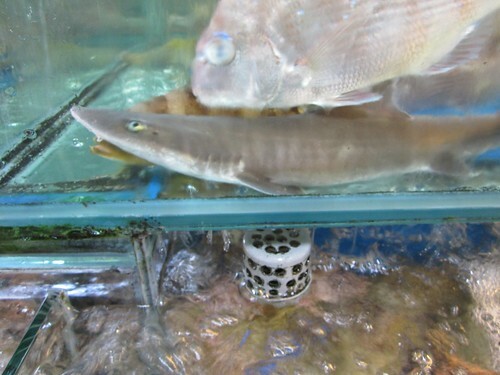 This fish is called golden knife fish. We were not sure what to make of this. Apparently the fish in it's natural habitat stands face down and thus looks like a kitchen knife. 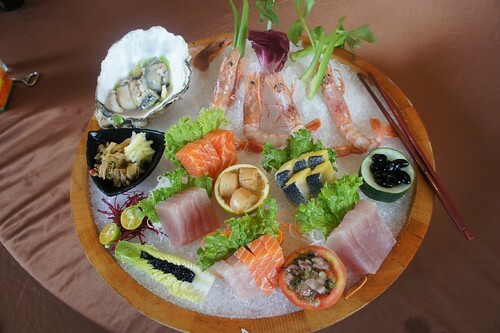 The staff insisted that we eat the fish freshly cooked, because as it cooled the meat got tougher. 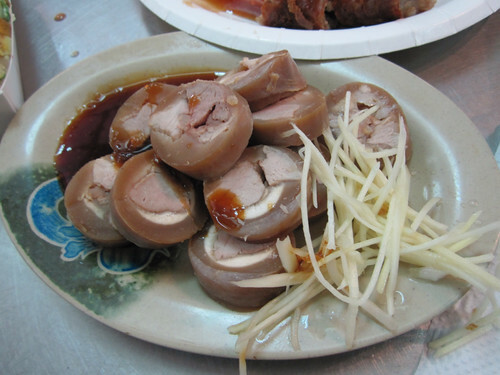 It's cooked "white water" style which is a quick poach and finish with hot oil over a bed of green onion, garlic and ginger. This one is a new one for me, i've never encountered this dish. It's a taro puff (but dense in the center) topped with a egg white mixture. I figured out it had egg white, mushroom, and some sort of fish stock, we debated if the prepartion was a quick fry or steam. 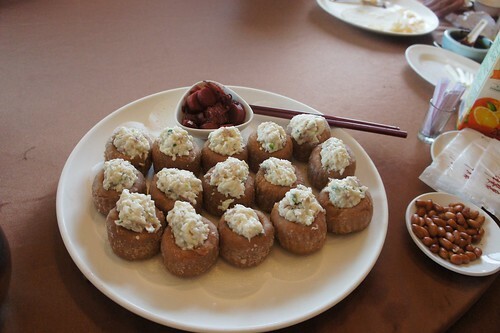 The Taro Puff was accompanied by pickled vegetables. 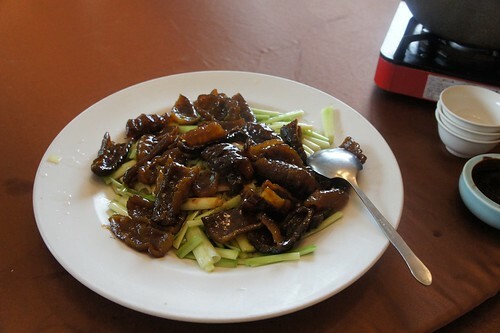 Sea Cucumber cooked with LIly stems. Sea cucumber is one of these ingrediants I don't quite understand. I need to do a bit more research into the benefits. It's usually sold in a dehydrated form and re-consituted. It's got a squishy and somewhat slimey texture (making it hard for chopsticks). It' always served as part of an "very nice" meal but usually is flavorless. 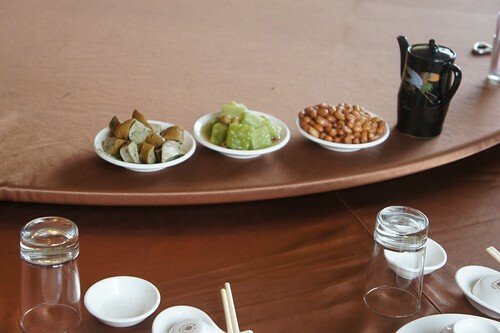 The first part of dessert is a sweet soup of red dates, white "wood ear" (mushrooms) and lotus seeds. This also considered a "Boo" or "hearty" dish reserved for the winter. It's December and we're rocking 60 to 70F. 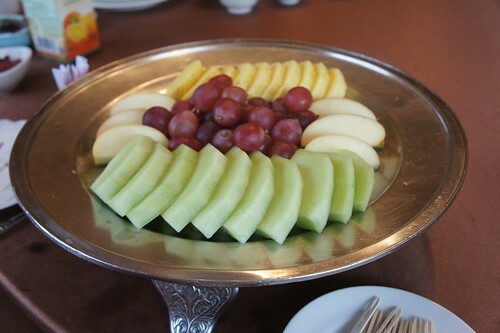 Finally, every Chinese meal, whether a banquet or a meal at friends house ends in fruit. Needless to say no one walked away hungry. It was a ridiculous amount of food. And I really enjoyed having such a wonderful meal with my family here in Taiwan. It's a rare treat to be able to get everyone together. Ok I think there are a few more posts in me before I head out of here next week. Did this pic on our drive to sun moon lake. 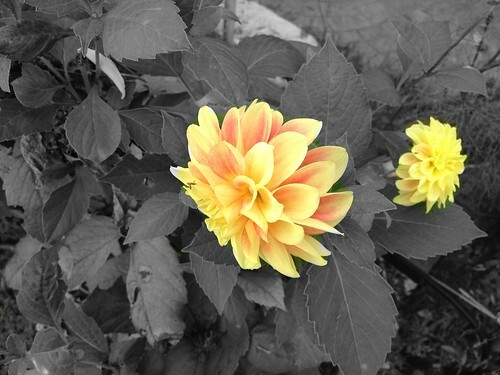 Took the pic with my iPhone and used the colorburst app. Anyhow, not bad with an iphone and doing the photo work with your finger on a bumpy car ride up a mountain. 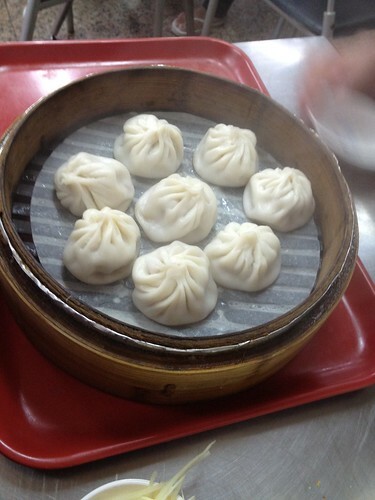 This is part two of my food post for my trip to Taiwan. It's been really neat, I've seen a ton of interesting stuff like, temples, lakes and mountains (we got up to 13,000 ft) and of course the food. So much neat food and I have so many pictures I decided I needed to just pick out a few highlights and go from there. 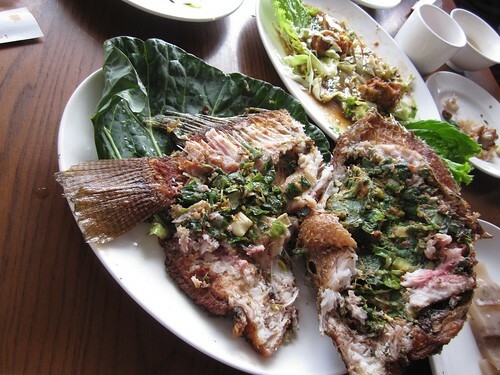 Interesting preparation: TIlapia sliced length wise stuffed with greens and aromatics. Then folded width wise tied and deep fried fried. 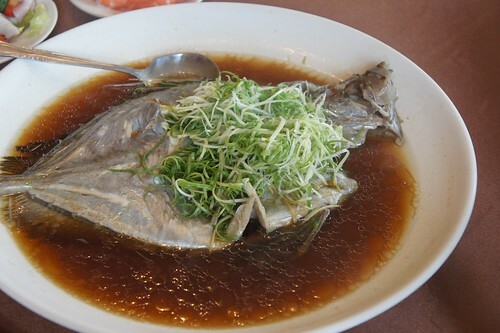 The fish is extremely tender and the exterior fins and bones are completely edible. 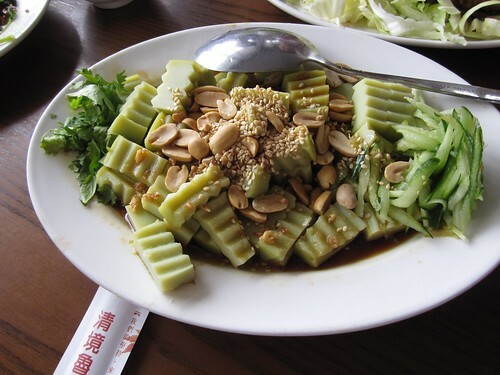 Green Tofu with sesame and peanuts in soy vinegar sauce. Auntie said it was made from green beans (perhaps as opposed to white dried soy beans for soy milk). Maybe fresh soy beans like the edamame you eat in restaurants I was unable to get a clarification. The really neat thing is that the restaurant where this dish and the fish above were taken, all of the produce is literally grown right outside the restaurant. Talk about local sourcing! Super fresh food and the most tender Chinese water spinach I've had. Hands down the most unusual breakfast I have ever had. Mexican stone leaf (i think it's a succulent type plant) two types of bitter gourd, Clams in Soy sauce broth, salted duck egg, two types of siu mai braised tofu, jelly fish salad, dragon fruit, boiled sausage, and of course bacon. I crowded the most interesting things into this one plate. It's a little weird but for both the ham and the sausage they were "boiled". They had the traditional Congee as well, and they had some other stuff that I just couldn't get to. It's good to see that no matter the culture bacon still makes the breakfast menu. 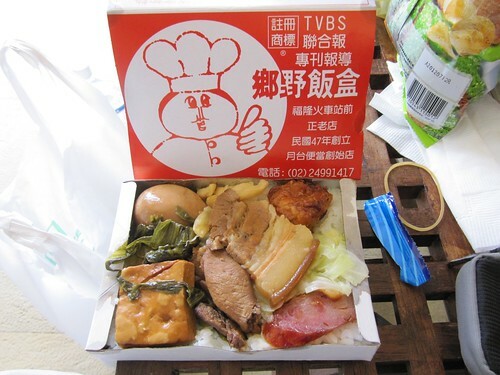 We went to Fulong city they are famous for they're train bentos. One of my cousins was telling my sister, "oh yeah if you go to Fu Long you've got to get their bento". This box of food is produced out of a very small kitchen. You don't get any choices here the only question the person in the kitchen asks is: "Ji Ge?" How many? There was a line of easily 50 people ahead of us ordering stacks of these boxes. It's the simplest of lunches, five spice braised meat, tofu, and egg, pickled mustard greens, sauteed fish cake, slab of braised pork belly (which apparently is everywhere here), sausage, cabbage over a bed of rice. The cost? 45 yuan, like a buck and half. If you get it on the train they mark it up to 100, but if you're not stopping at Fu Long then you don't have much of a choice. We dined at the Imei factory. They are very famous for their cookies and pastries. Many people buy their specially packaged cookie "tins" as presents for folks back home. They recently opened a restaurant and served fresh made dim sum. 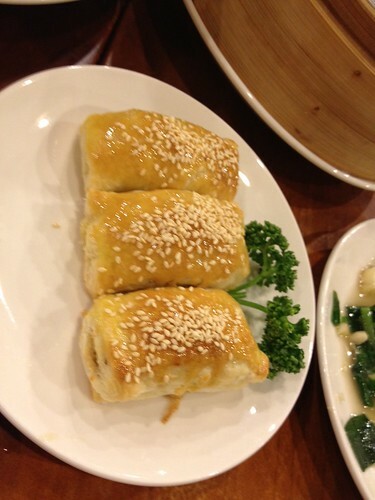 The above is a pastry that is stuffed with sweet roasted pork and paste made with dates and honey. Very tasty! Their sign at the front claims that they are about sustainable organic foods. I think there's a pretty big movement on this type of dining here in Taiwan. Most people eat out because they have limited kitchen space and the food is extremely inexpensive this makes it doubly more important that what they consume is chemical free. I've managed to catch a cold I'm not sure how much more posting I'll get in, we'll see. Nothing like being sick to make you miss home. My awesome Uncle took us to the Hsin Chu fish market as one of our stops on his tour of Hsin Chu for me, my sister and brother in-law. This place always amazes me every time I stop by. 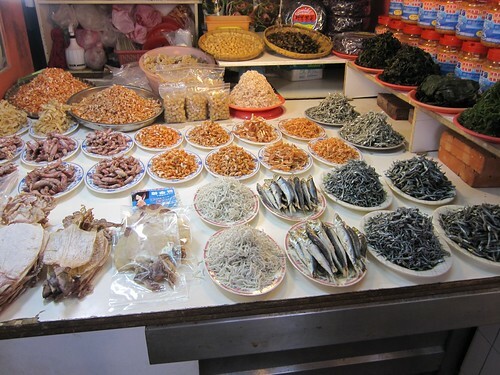 The above is one of the stalls that sells dried seafood. I'll keep this post short on the yammering and just give some pics and descriptions. Fresh water crabs they aren't the famed Chinese hair crabs but I was told they go for at least 30 USD a piece. So there's pretty darn close to the pricepoint. 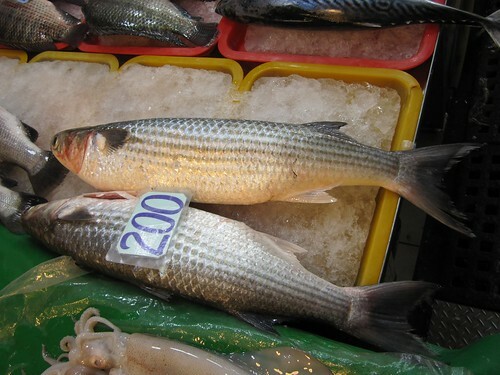 The famous Black Mullet (also I've heard it called Grey Mullet) prized for it's roe which is dry cured and considered a delicacy. One of my most favorite foods. Expensive and hard to come by. Apparently the italians prize the roe as well (called Bottarga Di Muggine). They grate the cured roe over pasta. Can't say I agree with that application but different strokes for different folks I suppose. 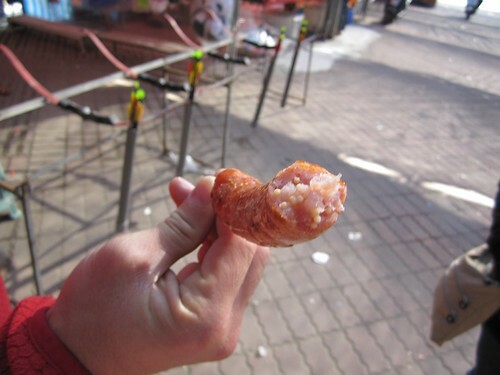 Street vendor had some sausage with flying fish roe. It's a sweet chinese style sausage with flying fish roe mixed in. A very unusual texture, like a regular sausage but punctuated with crispy pop from the roe. A very fun excursion trip. I didn't end up buying anything because we were still full from the street food (see previous post). There's a restaurant on the second floor where you can take your purchases from the market and have them prepare it any way you desire. I love this place! 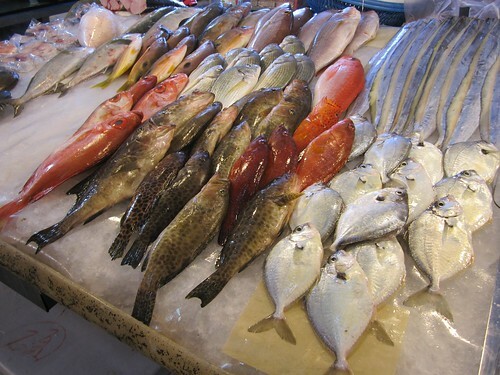 I leave you with a a picture of some beautiful fresh fish. I'm still working out this blogsy software, sorry about the formatting. I decided to make this trip sans laptop and try to do everything off the iPad. I have to say, not having internet is a real handicap but when I actually manage to find access it's been pretty successful. For instance I managed to find some wireless while at my grandparents (open wifi at a hotel across the street) and uploaded a bunch of photos to start my post. I worked on the content offline and waited for more internet to post. I'm still getting use to it, I have a photo connector to download new photos from my iPad. Anyhow first full day in Taiwan and visiting relatives and off course it's all about the food over here so day one didn't disappoint. We started our day in Tao Yuan. 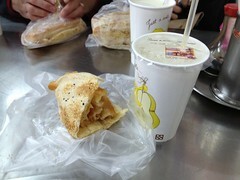 Breakfast starts off with hot soy milk and fried "donut" (literally called Oil stick) in a flaky sesame bun. The donut itself isn't sweet nor is the flat bread like bun which is somewhere between a flatbread and a pastry dough in consistency. 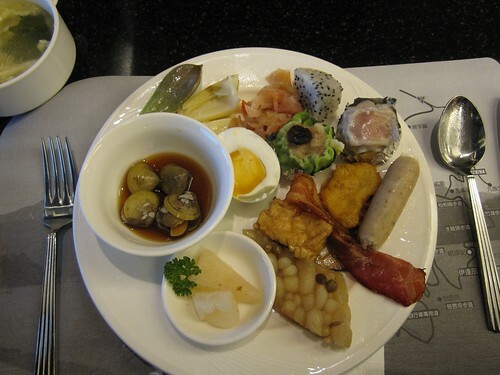 As with the an American breakfast, it's got a good share of carb goodness to start your day. The other breakfast specialty here was the Dragon purses, or soup dumplings. It's a steamed bun with meat inside, the way it's prepared there's also a good bit of broth that spills out as you bite into it. Some places specialize in giant versions of this that you first drink with a straw before cutting into it. This was a big favorite of my brother in-law, he claimed he could have wolfed down a couple more trays of those. We hopped a train and proceeded to visit my grandparents and uncle in Hsin Chu. One of the things you'll notice when coming to taiwan is that there's a shrine pretty much as often as you would see a starbucks in the US. 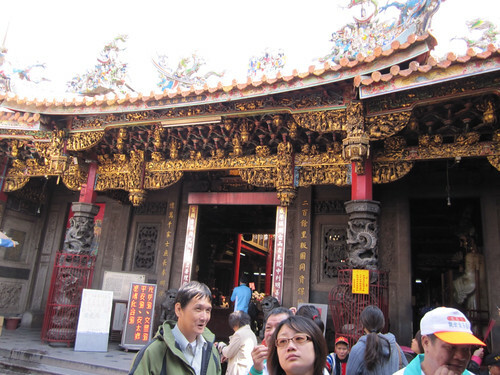 The one pictured above is a very famous one in Hsin Chu and is happily located next to a food market. 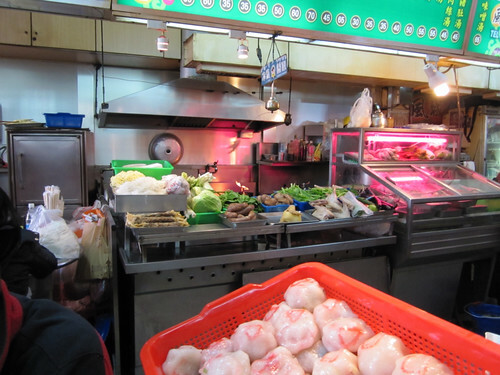 These markets probably wouldn't pass any health food inspection back home but of course that's where you find the best foods. My uncle explained that the little food stalls are actually passed down generations and that the 30 square foot of cooking/eating space is probably some of the most valuable realestate around. Most of the vendors carry the same type of stuff and my uncle brought us to one place where he has dined with family for about three generations during his lifetime. First we start with Oyster Pancake. It's a pan fried mixture of oyster, egg, vegetables (I think chopped bok choi) and batter. The batter consists of, tapioca flour and stock. 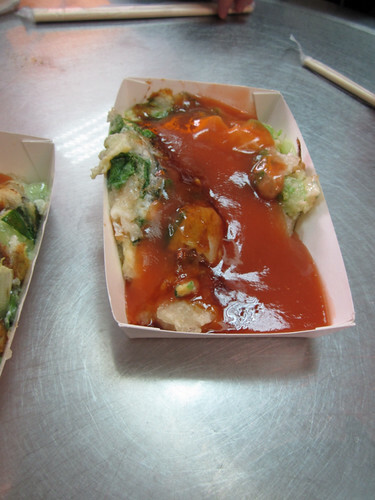 It's topped with a sweet sauce, which I think is oyster sauce. 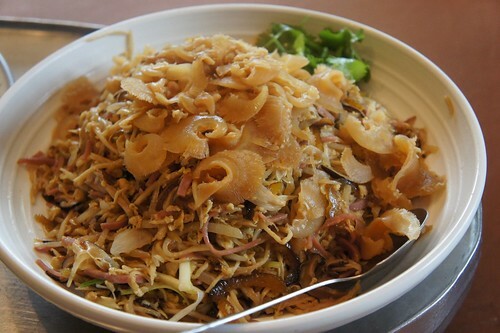 It's a love or hate texture, but a definitely authentic taiwanese dish. The resulting dish is a bit gooey and hard to cut into and remains pretty true to the oyster in it's raw form. 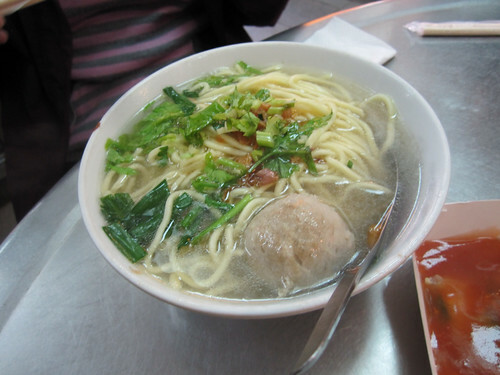 Second course was a noodle soup with beef tendon meatball. There were two types of noodles here, an egg noodle and a rice noodle vermicelli. The stock for the soup has been stewing a long time with large hunks of pork shoulder. 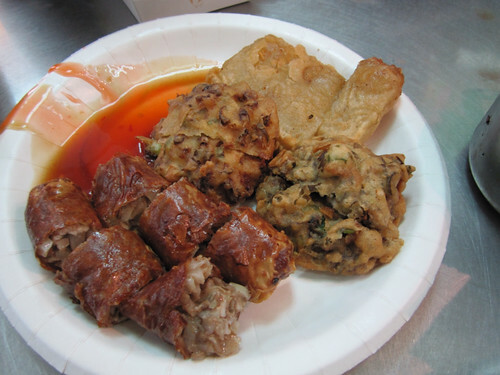 Next was a fried plate of Fried oyster pancake, fried sweet rice cake, and chicken roll. I'm not sure I heard the name of the chicken roll correctly because I believe it had pork in it, the wrapper was a tofu skin wrapper. Needless to say all three were delicious, kind of hard to go wrong with fried stuff. All three were served with a sweet chili sauce. Above we have Hsin Chu sausage. 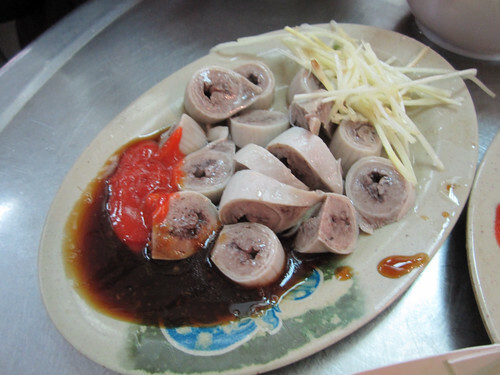 It's a steamed sausage, that's very large whole chunks of pork fat and thick walled intestines as casing. It's unusual since normal sausage has very thin casing. Pork intestines. Came with a chili sauce. This is one of those things that my uncle told my brother in-law to just eat it and ask questions later. I give him great marks for being adventerous, being Chinese there are few very things that I won't eat, as an American I didn't think he'd go for it but he went full gusto and enjoyed it. The texture was like eating a properly prepared squid, which is to say has a chew but not like eating a rubberband. There's no real flavor to mention, its a great container for whatever condiment you use it with. Remember the pork stock I mentioned from the noodle soup. 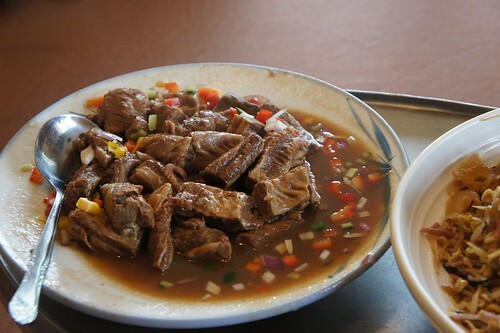 The resulting stewed pork is what you see above. The meat is not very flavorful since it all went into the stock but it is very very tender and goes great with a garlic soy sauce. Here's the most awesome part. I think we had about two of each dish plus one I didn't get a picture of a squid soup. The whole thing fed five of us and we had some to take home. All that cost us around eight bucks in US money. Can you believe that? I'm finding food to be extremely reasonable here. The cost of gadgets is about the same but street food is very inexpensive. Ok this post went long so I'll have to revise this. 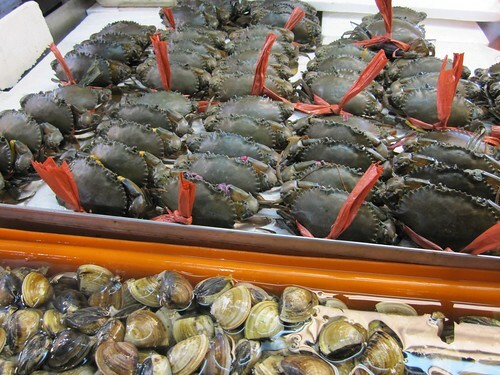 We went to the fish market later on so I'll do a post on that when we go to Fu Long today to go rock climbing. Ok TTFN.